If this time of the year reminds us of anything, it’s of our traditions. In the strategic planning world, fall and early winter are busy times for us. We are at the top of our service cycle and blessed to work with companies across the country that are renewing their strategic plans or realizing that they don’t want to begin another year without one. If you’ve signed on to this newsletter, chances are that you appreciate the value of a strategic plan done right. One basic tool to approach planning with diligence is the use of a SWOT (Strengths, Weaknesses, Opportunities, Threats) analysis. What does the company do best? What are our company’s functional capabilities? What must we do to succeed long-term? How can we be more innovative and effective? What unique resources or capabilities do we have now, and what do you lack? Of note: Many people get confused about the difference between strengths and opportunities, as well as the difference between weaknesses and threats. Like directions on a compass, the “S” and “W” is your internal orientation, where the “O” and “T” is discovered in your outward environment. Strengths are only meaningful when they assist the firm in meeting customer needs. Weaknesses that might not seem outwardly apparent to customers often will still manifest through the experiences that they have with your company. By thinking of your strengths with the above points in mind, you’ll then better understand your core competencies because they will be tied to satisfying a customer need. If you want to check out more about internal analysis, please feel free to browse this free chapter on internal analysis from the recently re-released Strategic Planning Kit for Dummies, written by our Chief Operating Officer Erica Olsen. How fully do you understand your internal environment? Strategy implies being ready for the future, which can sound a bit daunting. Putting an actionable plan together may even seem impossible to accomplish given the unpredictability of time. Yet the truth is that the simplest strategies see the most sustainable success. 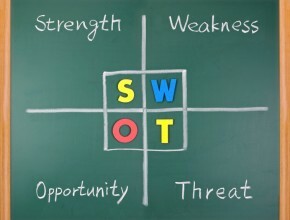 Using a SWOT analysis helps make framing your strategy much less complicated. It offers a categorical way to capture present and anticipated conditions that matter. In our last newsletter we talked a bit about the importance of recognizing your internal Strengths and Weaknesses for strategic planning. This week let’s go outside the walls and halls of your organization and begin to identify those Opportunities and Threats beyond your control. Your Customers: Who are they, what motivates them, and what are their unmet needs? What is an opportunity you might fulfill for them? Your Competitors: What are their strengths and weaknesses, what strategies and structures do they employ, and what kind of image do they cultivate? How might these elements present a threat to your business? The Market: What is the overall size of your market and is there projected growth? Is the distribution system optimized? What are some key success factors to engage with or develop to better position your company? Our Environment: What technological, governmental, economic or cultural disruptions would most impact your company? How can you strategically address these uncertainties? As you can see, understanding the external environment is a necessity for best chartering strategy. The world is indeed a complex place, but employing a SWOT analysis consistently over time will give you clarity to simplify the conversation. It’s one of the most effective tools for strategic planners, and worth remembering that with the appropriate use of tools, pyramids have been built and mountains moved. Focus on your strengths. Shore-up your weaknesses. Capitalize on your opportunities. Recognize your threats. And don’t forget to predict the ways to measure your success! How will you capitalize on your opportunities this new year?